Buying a Shannon painting or having one created just for you is serious business. Here are some guidelines to help you make the leap into "art investment" by one of the most in demand artists in the world today. Art has been emerging as a new asset class for the well-diversified portfolio. The reported returns are enough to catch anyone’s eye: the index of fine art sales, used by art advisors to sell art funds, shows an average annual return of 10% over the past four decades. Tyler, Cheap Trick's Rick Nielsen, Graceland (Elvis), The James Dean Foundation, The Rock and Roll Hall of Fame, and many more. Give us a call at 310.739.4930 to discuss your investment in Shannon Art. 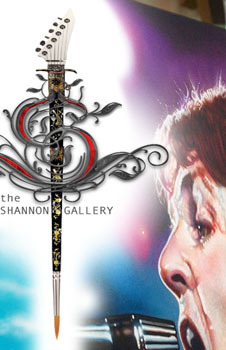 Also have a look at Shannon's "Gallery Page" to see some samples of Shannon's amazing works. If you are looking for a portrait of someone special, yourself, corporate substance, a pet, etc., please look on this page at our "Special Portrait Info" section. Commissioning art is as easy and as difficult as buying a brand new automobile. It should scream, "YOU!" Shannon has been commissioned to create work for The Beatles, The Cavern Club, Trump Casinos, members of KISS, The Rock and Roll Hall of Fame . . . The list goees on. Steven Tyler asked for Shannon Art on canvas. 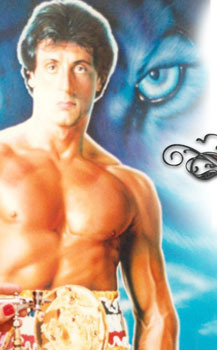 Sylvester Stallone asked for Shannon Art on a jacket. Rick Nielsen asked for art on his guitars. The Rock and Rall Hall of Fame asked for art on a 10-foot Stratocaster guitar. Rosie O'Donnell asked for "Anything Babs!" (Barbra Streisand). Donald Trump asked for art on clear plexi-glass to cover his casino floors. The Beatles topped them all! They asked for 112 paintings on canvas for each room of their first ever and only themed hotel in Liverpool, England. No matter what your commission is, Shannon has created the best for the best. Each portrait has its own price. Please give us a call at 310.739.4930 to speak in detail. When calling have the following info ready: Budget, Canvas Size, Black and White or Color, Square / Horizontal / Vertical, and Deadline (if any). Most paintigns take about 3-months to complete. IMPORTANT: THERE IS A WAITING LIST OF AT LEAST 3-MONTHS. Portrait art can be one of the most wonderful things to experiece and should be. Whether a gift for someone, a corpoate company recognition, an honorary diplomat, a loved one, the family, or plain and simply . . . your hero, Shannon can create your this treasure to your expectation. disapointment of commissioned portraits that look nothing like the person or persons who are the subject(s). Shannon has hit homemruns with all of her portraits. A painting should bring out only the best of the subject - putting them in their best light. Please check out Shannon's "Gallery Page" to see the beautiful examples of her portrait work. She is by far . . . one of the best! If you wish to use photographs, Shannon prefers at least four (4) photos. A good rule: A photo shoud be clear enough to see the eyelashes of all individuals involved. Shannon can also visit your home to take photos if needed. "Live" portrait painting in your home is another consideration. Keep in mind this can take up to 3-months to complete. discuss, in great detail, exactly what you are looking for. Whether you need a commercial jingle or a full blown orchestrated movie theme - we can help. Shannon knows many great musicians available for work, all over the world. If you need expert musicians with expert chops, look no further.